If you are set on a Weber grill but aren’t sure what to choose you aren’t the only one who has had this problem. They have a host of grills, in particular the Genesis and Spirit lines of grills which both have their own styles and small difference between them. Below I am going to go over each of the grills in both categories and give you a brief overview each of my favorites. Then I will give you my thoughts on what exactly are the difference between the different models and what one will be best suited to you and your budget. So, as you can tell there are a host of options available both of the ranges have their different models some of which have additional features and extras. Having used a selection of the grills myself I will choose one from each and give you a short review of them and the comparisons between the two. As for the grills I have chosen for the comparison – I choose them because I feel they are the best options for each of the different Weber grill lines both of which offer top notch quality. I could have done the more direct comparison between the Weber Spirit E-310 and the Weber Genesis E-310 but I instead choose the E-210 because it is very similar to the Spirt E-310 but with a significantly lower price point. The Spirit E-310 is basically the newer model to the E-210. For a more detailed comparison check out my article – Weber E210 vs E310. Now for the Spirit E-210. 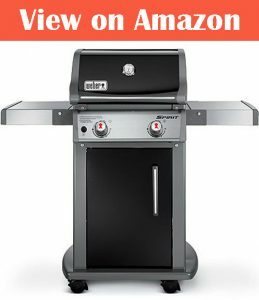 This grill has an excellent design and top notch build quality that really is hard to beat when it comes to grills. The main base of the grill is made from steel and there are some areas which have are painted black which gives it a nice premium look and feel to it. The set up with the grill is also a doodle and very simple. The directions are easy to follow using the included pictures. As far as the grilling goes it works like a charm. The grill heats up quickly and the heat is spread evenly across the whole cooking surface. There aren’t any cold spots which can be problematic on some poorer quality grills I have used in the past. Also, the included hood can be closed over to make for an almost oven like effect to retain all of the heat inside. You have a temperature gauge built into the hood of the grill which is really useful for keeping a check on the cooking temperature. Just above the main grilling there is a raised area where you can cook things at a slower pace or for me personally it can even be used to keep the food warm once the burners are turned off. It could also be used to slow cook vegies as the heat here doesn’t get just as hot as the main grill below it. As for the cooking bars they give an amazing sear effect that works on all kinds of foods but with meats I was particularly impressed. On the sides you have areas which can be used to prepare food or even to place food after cooking or whatever you prefer to use them for. They can also be folded down for storage or if you need it to fit into a smaller space. The grease management system also works extremely well with a grease tray that can be easily removed for cleaning. Some soap and hot water and a cloth and you will have it good as new in a couple of minutes of cleaning. The same goes for the cooking grates which are easy peazy to clean. Cooking area may not be best suited for bigger families etc. When you look at Webers Genesis line of grills you will see that the Genesis grills are usually more expensive. They are meant to be a little more premium and are usually bigger in size both overall and for the cooking area. This one has 3 burners which can be powered by propone/natural gas and this means for a much bigger cooking area which could cook for 5-8 people at once. Also, the side shelves are also bigger and offer more space than the Spirit counterpart. They can also be folded down for smaller spaces or storing the grill in the winter. The first thing you will notice with this Genesis grill is its size is much bigger when compared with the Spirit counterpart. It also looks a little bit more premium though there isn’t a major difference between them there. Cooking with this grill is amazing. It heats up incredibly quickly and just like the spirit has a temperature gauge on the hood. In a handful of minutes, it can heat up to 400 degrees and even further after some time. As for heat distribution it is flawless. Everything cooks through well and there are no cold spots anywhere on the grill. The cooking grates are also made from cast iron which hold the heat better than stainless steel or something of the like. It also makes amazing sear marks on the food. As for the cleaning – all of the grease flows down into a tray which can be replaced or cleaned which is simple. The grates here can be removed for cleaning which too is easy to do and cleaning them should only take a handful of minutes to get them looking as good as new. Overall this is a highly premium grill that is made to last and does exactly what you want from a grill. When I compare both sets of grills directly to each other there are really only a few small differences. The main difference being that the Genesis is a little more premium quality and each of the parts has a slightly improved design but in terms of overall functionality they are both almost identical. Both do all the important things well and for me that’s the most important thing. 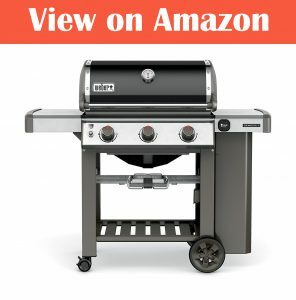 If you are wanting a bigger grill that offers a lot of more cooking space I would recommend the Weber Genesis E310 though for most people I think the Spirit line of grills is the best option and more specifically the Spirit E210. This is because it functions just as well as all the other Weber grills but offers a much more affordable price point, so I would recommend that you go for that one but if the price isn’t so important for you then the Genesis E310 is also an excellent choice.